A fine pair of Antique late Victorian Venetian Blackamoor Statues finished in polychrome gilt finish over fruitwood. 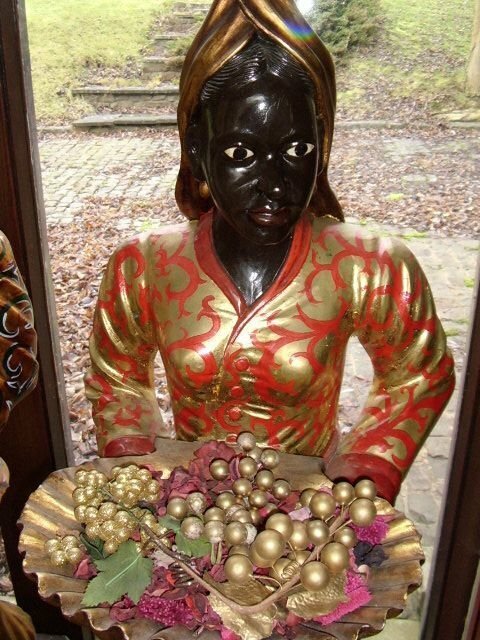 A fine matching pair with hand blown glass painted eyes and carved ivory teeth. 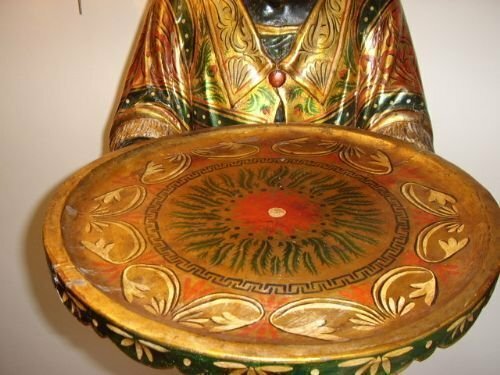 Supported on octagonal shaped bases which are hand decorated with fruit and gold leaf. A stunning antique pair which would have stood in the hallways of large historic houses on the continent. 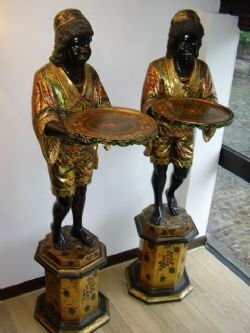 The trays would be laden with offerings such as drinks and the butlers would offer guests their refreshments and in return visitors would leave their business or calling cards. 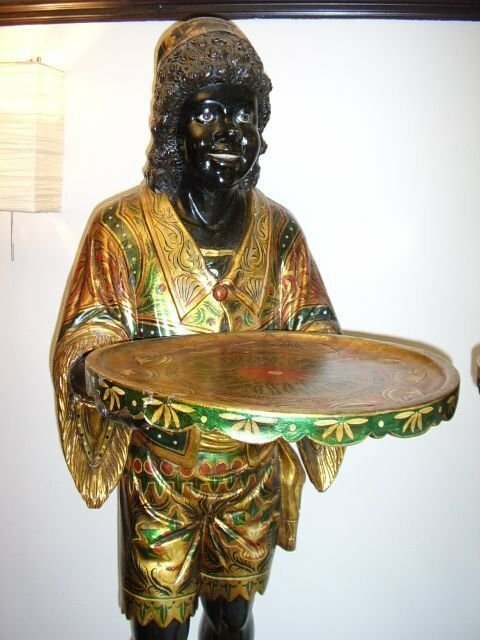 The Blackamoors are very detailed and elaborately painted,with the trays being secured with an hidden bracket. DEPTH: Including protrusion of the trays is 24 Ins. 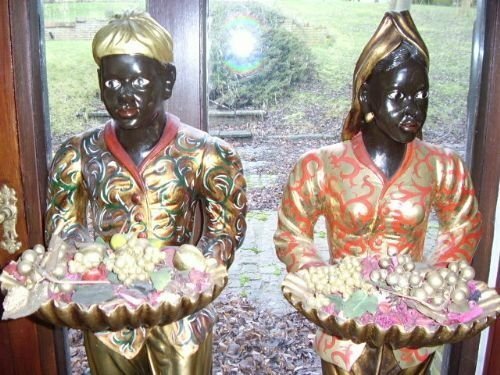 Condition is very good considering their age,they are above average,although a little further minor tidying would benefit them further. You probably will not see such a fantastic pair like these again,as they are often split from pairs. The shape of the bases is typical of the Victorian era and so we date these pair around the turn of the last century being about C1900. 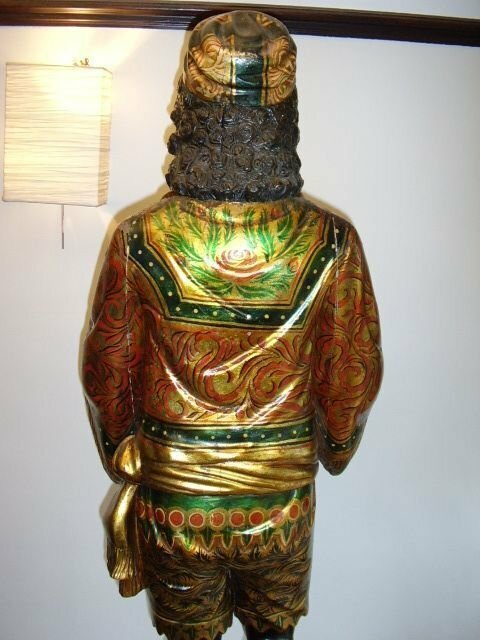 A good solid and heavy sturdy pair of amazing visual appearance,with stunning gold finish. 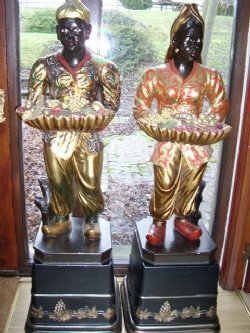 A fine pair of softwood painted Venetain Blackamoor Torcheres , beautifully carved and decorated in black and gold paint,with an upper candlearbra conversion,with hand crafted metal gilt leaves attached,having been cut out and made from thin steel sheet. 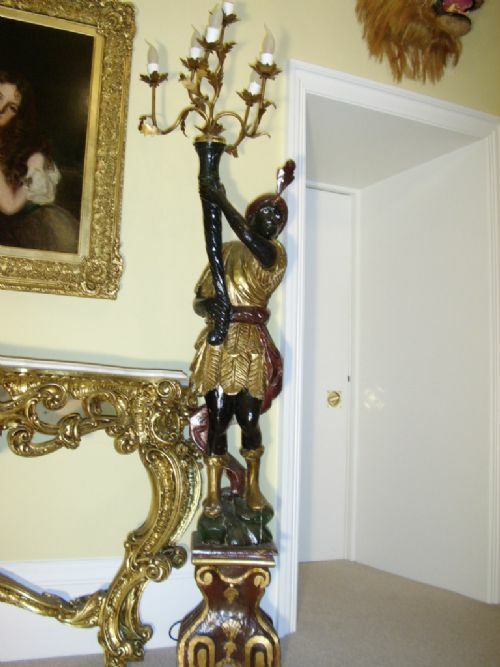 They have been rewired in the recent past and have been fitted with modern flame effect bulbs. 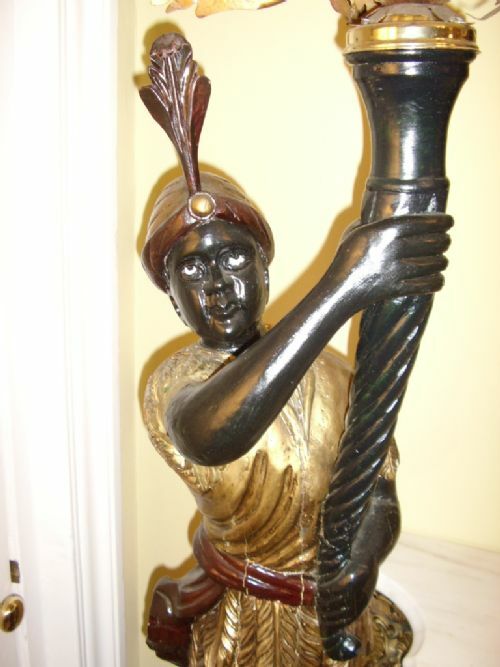 The tops of the torcheres have been fitted with a modern looking collar to secure the metal candlearbra attachment and arms above. 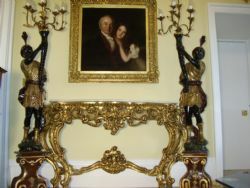 The condition is fair for the age and there are signs of careful restoration and some retouching. Further tidying would be fairly easy and would benefit them further. 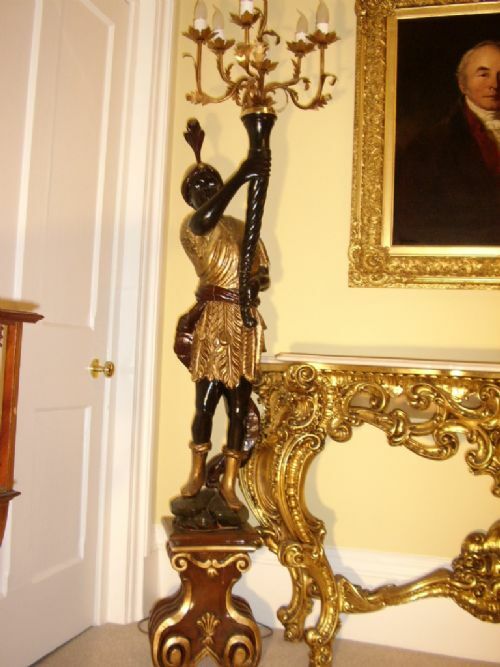 They are great antique examples,with similar modern copies seen regularly,still achieving high prices. 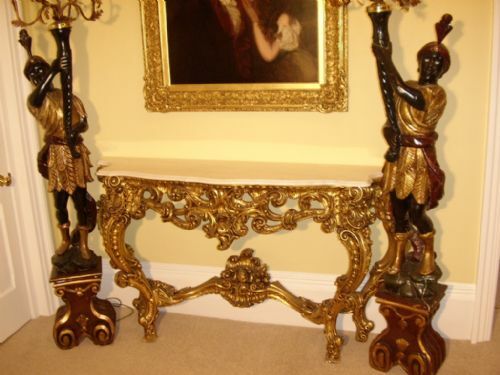 These candlearbra torcheres are a fantastic interior design antique which will appreciate in time. ALL ELECTRICAL APPLIANCES SHOULD BE CHECKED BY A QUALIFIED ELECTRICIAN BEFORE USE TO ENSURE THEY ARE SAFE & CORRECTLY WIRED. 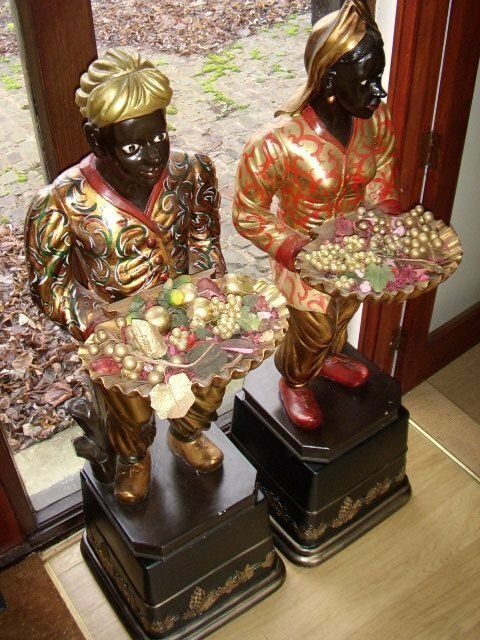 THESE ART DECO STYLE BLACKAMOOR STATUES ARE OFFERING FRUIT AND ARE ON ART DECO STYLE STANDS. 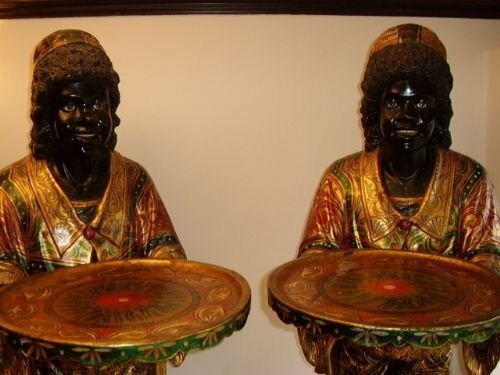 THEY ARE BOTH DECORATED IN GOLD AND ARE MADE FROM SOLID CARVED WOOD. 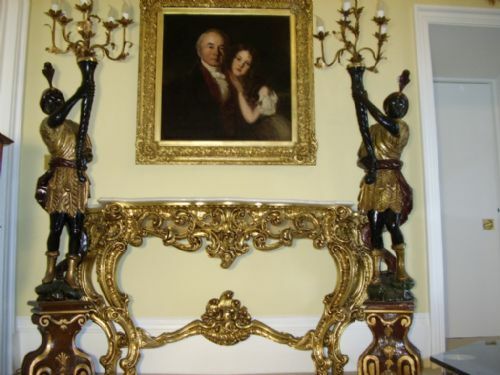 THEY STAND 5 FT IN HEIGHT & THE BASES MEASURE 181/2 INS SQUARE. 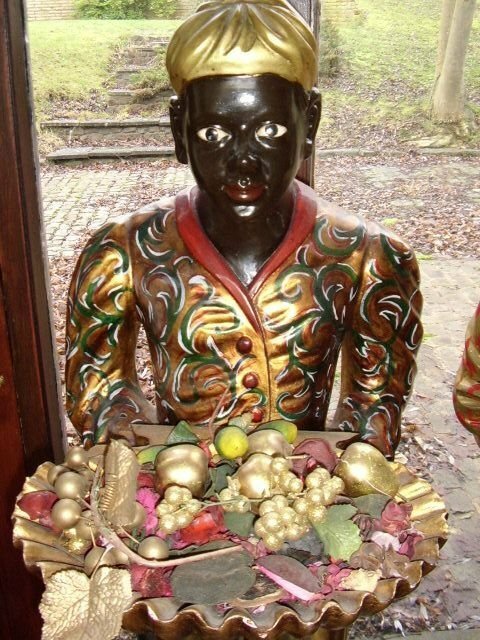 THESE FIGURES ARE MADE OF SOLID WOOD UNLIKE OTHER CHEAPER EXAMPLES MADE FROM POLYCARBONATE/HARD RESIN.